THERE BE THORNS The ubiquitous Himalayan blackberry was brought to the U.S. by Luther Burbank. Now it's everywhere. The embedded blackberry thorns are pulled fairly easily from the flesh of my thighs, but are far more difficult to remove from the denim of my jeans. The pants were a fashion choice I mistakenly thought would be fitting for an activity like picking blackberries in Sebastopol's Ives Park, but only resulted in agitation from overheating, frustration from picking tiny throwing stars from my legs and blood stains on the inside of my clothes. Plants, it seemed, had gotten the best of me this day. But wait—this is the land of Luther Burbank, the man who coerced nature to bow to his vision of the perfect plant. He invented the Russet potato, the spineless cactus and, yes, several varieties of thornless blackberry. As I soothed my wounded pride with the sweet taste of fresh berries, my burning legs prompted a good question: Where are those thornless blackberry bushes now? To begin, it must be understood that the blackberry most of us know in the North Bay is not a native species. The invasive Himalayan blackberry was brought here from Eastern Europe by none other than Mr. Burbank himself, who praised its structural heartiness and plump fruit. It was picked up by farmers and used as natural cattle fencing. But the plant was just too aggressive, and soon escaped into the wild where it had no natural forces to keep its thick, spiny stems in check. Now it can be found from Southern California all the way up to Alaska. 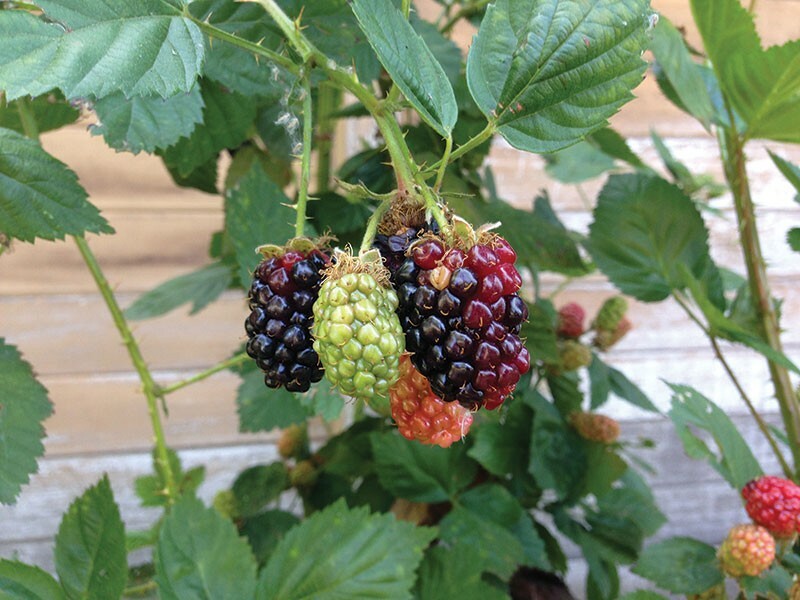 Oregon's Willamette Valley, however, hosts a variety of heirloom blackberries. Perhaps most well-known is the marionberry, which is a cross between Chehalem, a descendent of the Himalayan blackberry and the Olallie, itself a cross between the loganberry and youngberry. It was first introduced in 1956 by the USDA Agricultural Research Service at Oregon State University, and is now old enough to be called an heirloom variety, says Paul Wallace of the Petaluma Seed Bank. "When [a hybrid] is stabilized, after about eight or 10 years, it could be termed an heirloom," he says. When berries are out of season, fruit lovers head to the grocery store, where familiar plastic clamshells bearing bland, tough, enormous black orbs lie in wait with their $6 price tag. These are Tupi blackberries, a commercial variety grown mostly in Mexico. But what about that thornless blackberry developed by Burbank? It seems like such a wonderful idea, why didn't it take off? Well, Burbank wasn't doing his work just for the betterment of mankind. He was an inventor who sold his ideas; that's how he made money. He invented 16 blackberry and 13 raspberry varieties, but not all were commercially successful. The plants are available to home gardeners, but apparently don't make financial sense for farmers to grow. At Luther Burbank's home and gardens in Santa Rosa, many of the varieties are on display now, with berry season nearing. It is truly amazing to grasp the stalk of a seemingly ordinary blackberry plant and not recoil in pain. But as the sweet reward of my excruciating berry picking conquest trickles down my throat, I can't help but wonder if the berries would taste as good if they hadn't required a little blood as tribute.